But how is he growing them in Sweden, Maine? Jesse Stevens owns Sy’s Trees, a nursery and orchard in Sweden. He has a collection of 70 fig trees old and strong enough to be bearing fruit and is testing varieties to see what can thrive in Maine’s not exactly Mediterranean climate. We called him up to learn more about his tendency toward “weird zone pushing kinds of things” in advance of his talk “Figs, Kiwis and Honeyberries” Saturday at the Common Ground Country Fair (from noon to 1 p.m. in the Hayloft). TREE HUGGER: Stevens grew up in Maine and always wanted somewhere to plant trees. He has just 2 acres in Sweden, a portion of a former farm. “Our house is basically a little subdivided portion of this historic hayfield.” When he first moved in, he spent some time researching the heirloom apple trees there. “The trees were in rough shape. Decrepit. I thought, what I need to do is save this tree.” He learned how to graft, and yes, he made friends with Maine’s foremost apple expert, John Bunker. And he started planting apple, pear, plum, cherry, peach and other fruit seedlings there eight years ago. WHAT’S IN A NAME? We noticed that the orchard’s name is not Stevens’ and not Jesse’s. Who is Sy? That would be Stevens’ son, who was “age zero” when Stevens started planting what he imagined would be a small orchard for Sy to play in someday. “It has been a dream come true, because now he is climbing the trees.” As he has filled up the space, he’s gotten interested in permaculture. 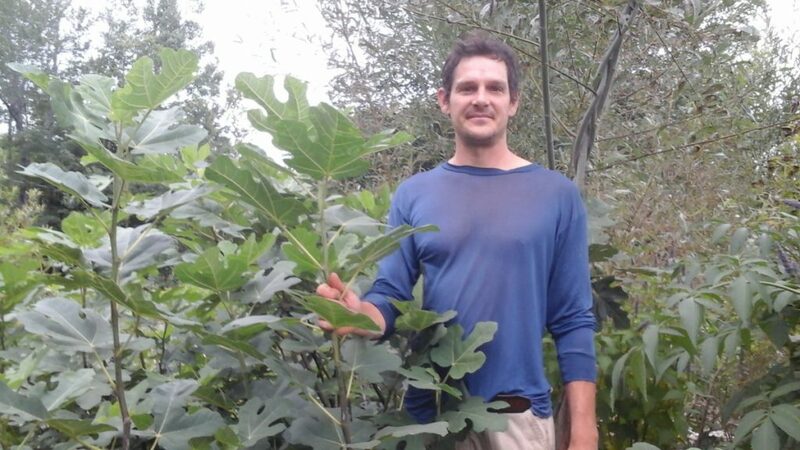 “Which opened up this whole new world and made me think, I need to be planting all kinds of stuff.” A permaculturist introduced him to the idea of trying figs. IN THE ZONE (NOT): It’s not unheard of to try to grow them in Maine, but figs are way out of their comfort zone here. They are recommended for growing in Zones 8 through 10 (we’re talking Texas, Florida, California and the South) but according to Mother Earth News, can do well in Zone 7, if in a protected site. So Stevens, who lives in a Zone 4 area, is way beyond the customary limits. First question: Why does he do this? At one point in his life, he lived in northern Florida, in a Zone 8 area, where there was a big fig tree in the front yard of his house. “There is just something about figs that captivated me.” Flavor had something to do with it. “That was my first fresh fig experience. They are way different from a dried one.” He has “work-arounds” to dodge the zone issue, he said. Like what? VIKING BURIAL: About a dozen of the fig trees stay in the ground and have survived that way for three years. Stevens prunes “them back really hard,” then bends some limbs horizontally and covers them with mulch. “It looks like kind of a Viking burial mound.” “They seem to be coming back stronger every year.” Right now, he’s watching them closely; they set fruit, but will there be enough heat to ripen it before the first frost? SLEEPY TIME: The rest of his crop he moves inside to the cellar, in pots that range from 3- to 25-gallon sizes (anything bigger and the move gets back-breaking). The cellar is unheated and the temperature hovers between 40 and 60 degrees. “They just sleep away from November until May or so.” In the spring, he moves them outside, and these plants have been yielding for a couple of months. He’s carefully monitoring which varieties are doing best in Maine’s 120-day growing season. He regularly consults with other fig fans in the Northeast.